Nelson and Colne College’s first Year 11 and Apprenticeship Open Event will take place on Thursday 11 October – and it is a fantastic opportunity to get a feel for life as an NCC student. Visitors can find out about the wide range of options available to study at NCC – including more than 30 A Level subjects, a wide range of high quality, career focused vocational programmes and Apprenticeship opportunities in a multitude of different sectors. The Open Event, from 5.30pm until 7.30pm, will also give prospective students the chance to enjoy a tour of the campus and view the college’s state-of-the-art facilities, meet expert tutors and members of the Careers Team, take part in a range of exciting ‘have a go’ activities and learn about Nelson and Colne College’s diverse and constantly-evolving extracurricular offer. Information on travel arrangements to and from College and the support available to students at NCC will also be available on the night. Hasana Mirza, 18, formerly of Marsden Heights Community College, progressed on to Lancaster University from NCC to study Biomedical Science after achieving AAB in her Biology, Psychology and Chemistry A Levels. She also achieved an A* in her Extended Project Qualification, based on Alzheimer’s. Hasana said: “NCC is one of the best colleges in the country and I feel proud to have been a student here. The college has a warm and welcoming community, which made it easy for me to interact with other students and make new friends. I also had the chance to take part in a range of extracurricular activities from archery to the A&E Cadets scheme. Ellie Richardson, who has achieved a Grade A Level 3 Diploma in Childcare, has progressed on to Manchester Metropolitan University to study Primary Teaching with Qualified Teacher Status. Ellie, 18, a former student at St Christopher’s CE High School, said: “My ambition is to become a primary school teacher and the knowledge and understanding of Childcare I have gained at Nelson and Colne College will help towards me becoming the best teacher possible. Jon Lambert, 19, formerly of Ribblesdale High School has just completed his Level 3 Apprenticeship in Catering at Grassington House and is now working full time at the restaurant. Principal Amanda Melton said: “Open Events at Nelson and Colne College are always a brilliant chance to showcase our fantastic provision and for prospective students to come and experience a taste of what life is like at the number one college in the country for 16-18 learner achievement. “Choosing a college is an incredibly important step, and our students also vote us as the best college in Lancashire for student satisfaction because of the exceptional all round learning experience they enjoy here at NCC. In its 2017/18 results, NCC achieved a 99% pass rate at A Level and a 99.6% pass rate in advanced vocational courses. Nelson and Colne College has been rated as Outstanding by Ofsted since 2005. 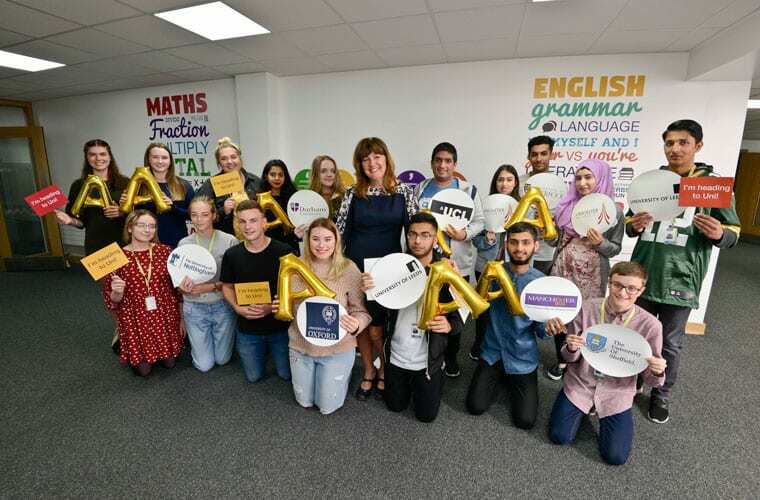 It is the top college in the country for 16-18 learner achievement, at all levels, is number one in the country for A Levels, based on progress scores, and the number one college in the country for overall Apprenticeship achievement, at all ages and levels. Government data also places NCC as the best college in the area for vocational courses, based on progress scores, while it is also the best college in Lancashire for student satisfaction, according to the FE Choices Learner Satisfaction Survey. For more information on NCC visit www.nelson.ac.uk or contact the Admissions Team on 01282 440272.